Forty-one years ago, protestors took to the streets to struggle against poverty, addiction, class difference, corruption of officials, etc. They held secret meetings, secretly distributed audio tapes and pamphlets in the dark of nights, wrote on the walls, held gatherings and went on strike, shattered windows and set fire to public properties, buses and banks, obtained guns and hand-made bombs, and killed high ranking officials which ultimately led to the (1979) Revolution. I studied all of these again during the 107 days I was in exile in Qarchak (Prison). These were the memoirs of people who had spoken proudly of what they had done, and now, many of them are high-ranking officials of this regime. But none of the problems that were supposed to be uprooted by those honorific actions have been eliminated; they have rather become worse than in the past and further supplemented by massacres and mass graves. Over the past 40 years, the criticisms and protests of our angry and tired people have been suppressed in the cruelest possible manner; they have been imprisoned, executed, sent to exile and (forcibly) disappeared. As done by ISIS, they were run over by cars. Even their religious convictions were seriously undermined by this Islamic regime. Qarchak Prison and its inhabitants are but a small part of the achievements of the revolution. “Revenge” is what is seen and heard most in our Islamic country! As a human rights activist and a staunch opponent of the death penalty, I am against all forms of violence. However, throughout the years of my activity, my beliefs and opinion were denied. I was told that retribution is right, according to Islam and the Quran! But I do not understand why only some people can exercise this right. And those who have suffered harms unfairly for 40 years, and their loved ones have been killed or imprisoned, are not allowed to exercise their right to retribution against the power holders, let alone to demand their own basic rights. And still, after so much pain and suffering imposed on my family solely because of me and my beliefs, criticisms, protests and peaceful activities, my family does not have the right to protest. Officials expect me to consider their actions as just; they expect that I give up my own beliefs, remain silent and comply with their orders. 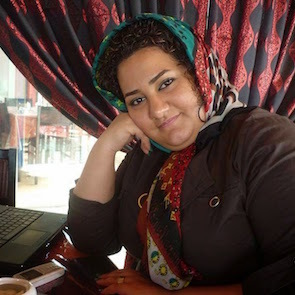 But Atena Daemi is today more determined and more serious than she has ever been to struggle for her goals, despite being so much mistreated and harassed. I want to speak about Ramin and of Hossein Panahi family who, young and old, have never experienced any calm or security during the past 40 years. Eight years of prison sentence for the eldest brother imprisoned in an undetermined status. Then to have him released, another brother is killed in a suspicious accident on his way to visit him. At least twice a year, one of their family members is summoned and arrested. Their house has been repeatedly attacked and ransacked to terrorize them, and they have been threatened, endlessly. Ramin has witnessed this oppression since very young age. He understood the truth like thousands of others and stepped onto a road that his loved ones went. A road that leads to independence and hundreds of people have been imprisoned and executed for it. Dear ones like Farzad Kamangar, Shirin Alam Houli, Ehsan Fattahian, Shirkou Ma’arefi, and the longest imprisoned woman, Zeinab Jalalian. In addition to his cause and his great goal, Ramin has repeatedly witnessed how families and his compatriots were viciously suppressed for their peaceful activities. He saw his old mother telling the Prosecutor after repeated arrests of her children that she would kill herself if they do not let go of her children. He saw how each member of his family was pressured to make his other brother, Amjad, give up his human rights activities in Europe. I can very well feel what Amjad feels. Ramin witnessed all this and became more determined to reach his goal. Today, however, he is accused of being a terrorist and sentenced to death based on the same tired scenarios! And her honorable niece who was also witness to all these catastrophic situations and was, herself, under tremendous pressure of security forces, preferred to die than to live under the yoke of tyranny. May she rest in peace. Yes, you must know that the more you resort to violence and repression, there are many who would rather die than to surrender to oppression, like the girls in Koubani who jumped from the top of Koubani mountains and died to protect themselves from being outraged by ISIS. Now, instead of torturing, recording forced confessions, and issuing death sentences, you should think why people are turned into critics, protesters, opponents and finally your sworn enemies. To find out why, you must examine your own behavior and actions. I personally reject all forms of violence. I condemn issuing death penalties under any pretext for anyone with any belief or creed. And Qarchak! This was a great, albeit bitter, experience for me. It was actually a great university! This forced exile opened my eyes even more on a great part of my society which has been forgotten or concealed behind false propaganda. I believe the intolerable conditions in Qarchak Prison should be strongly denounced. It is a concentration camp, a rehabilitation camp, and is called the Shahr-e Ray Repentance Center. There is a lot to say about this Repentance Center where one can find everything but repentance. I will soon speak out about the truth. I am grateful to those who were kind to us in any way they could despite their own agony and pains in that dark dungeon. I repeat that I am humble before each and every one of those prisoners, even if they were forced to swear at us or beat us! I am also grateful to everyone who remembered us while we were absent. In the end, I would like to express my gratitude to my dear family who have not left me alone even for a moment throughout these years, despite being beaten by electric shockers and batons.